What a fun turnout the other night at the opening of The Sunshine Boys at the Ahmanson. The first person you ran into in the lobby was the playwright Neil Simon posing for pics was fans. The Goldbergs (Jeff Garlin and George Segal) grabbed seats in the theatre together and when someone called Garlin his character’s name from the new T.V. show (Murray Goldberg), he didn’t turn around. “I’m still getting used to it,” he said. 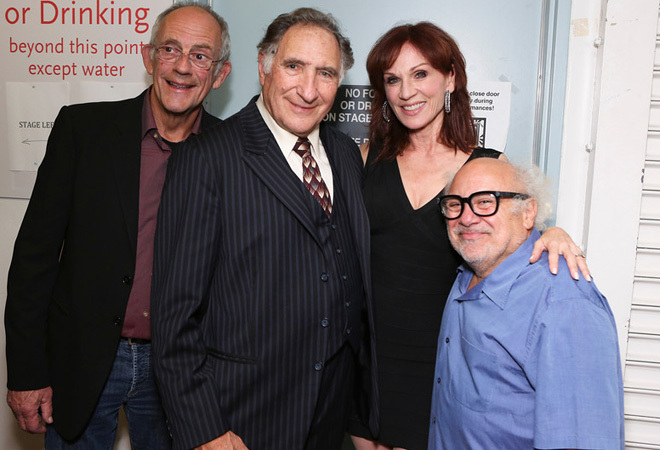 Danny DeVito and Judd Hirsch got laughs onstage then ran into their former Taxi co-stars (you do hear a flute playing?) Christopher Lloyd and Marilu Henner backstage. DeVito’s current co-stars Rob McElhenney, Kaitlin Olson, Glenn Howerton and Charlie Day from It’s Always Sunny In Philadelphia also all stopped by to see the show. Also spotted: DeVito’s wife Rhea Perlman in a seat dead center. After DeVito got out of his bathrobe, we joined everyone at an after-party at the Biltmore.